This photograph shows the entrance to the Arhai din ka Jhompra or 'Two and a Half Day' mosque in Ajmer. Begun by Qutb-u'd-din Aibek at the end of the twelfth century, it is a direct contemporary of the Quwwat al-Islam mosque in Delhi of the same patron. Ajmer was an important trading point on the caravan routes between Delhi and Gujarat. It was also the chosen residence of the Sufi Shaikh Muin-u'd-din Chishti who settled in the city in 1192, making it an important religious as well as commercial centre. It was therefore a well-chosen site for the construction of a new mosque to announce the arrival of a permanent Muslim power in northern India. The mosque lies close to the 'dargah' or shrine of Muin-u'd-din Chishti with the bazaar in between the two. Like the Quwwat al-Islam mosque it was constructed using spolia taken from Hindu and Jain temples. It follows the Arab mosque layout of a courtyard surrounded on three sides by a covered corridor and on the fourth by a deeper prayer sanctuary aligned towards Mecca. This view shows the eastern entrance to the mosque courtyard approached up a series of steep steps from the bazaar outside. 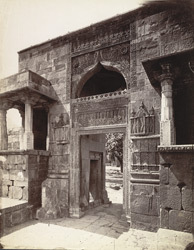 A later addition of an arched screen in front of the sanctuary facade was made by Sultan Iltutmish in the early part the thirteenth century.